The Mühleisen company was founded in 1986. Today we are a team of 26 masters, journeymen and apprentices working in harmony. We take pride in our ability to work together closely as part of the effort to produce instruments of high integrity. It is not easy to geographically define our tonal concepts and designs. One can see and hear the southern German tradition in our work. Most importantly, our sounds are “Mühleisen” sounds, the result of intensive study of space and sound. Since touch and playability are the essential focuses of our work, we principally build mechanical-action instruments. In order to create this playability, we purchase the highest quality and most suitable materials, thoroughly plan the construction and maintain the highest standards of craftsmanship. We give our best to meet our high standards in the areas of function, longevity and aesthetics for each component which goes into our instruments. Our instruments are all individually designed to blend with the architecture and style of the church where they will be located. 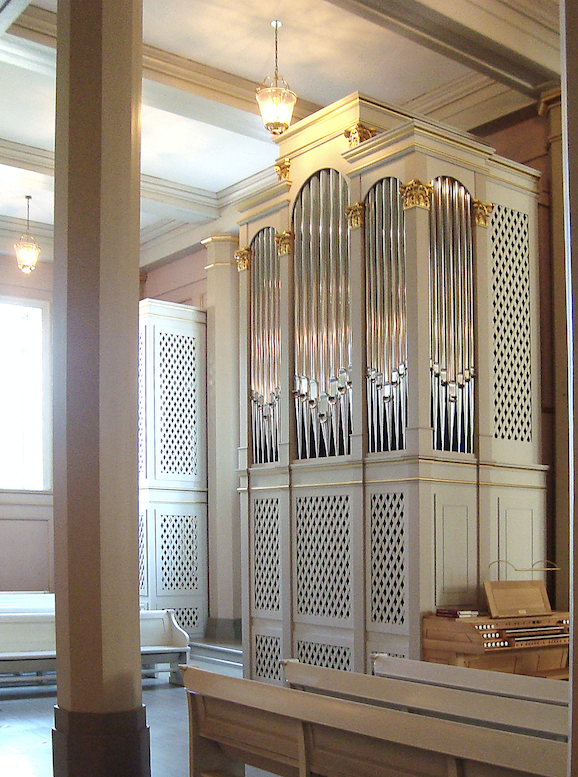 Since we think of the organ predominantly as a musical instrument, the structure and facade design are based on unalterable technical and tonal needs. We have built over 100 instruments ranging from one-manual instruments through three-, four-and five-manual organs. We are working on several new instruments at the moment. Along with new construction, we find that restoration of 19th and 20thcentury organs is becoming an important part of our shop’s work. Our experience with all known types of actions and our ability to understand these earlier tonal concepts is what recommends us as builders. Last but not least is our capacity for tuning, cleaning and service work which we do with great care and reliability. "Der Klang einer guten Orgel gehört zu den erfreulichsten Leistungen unserer Kultur."